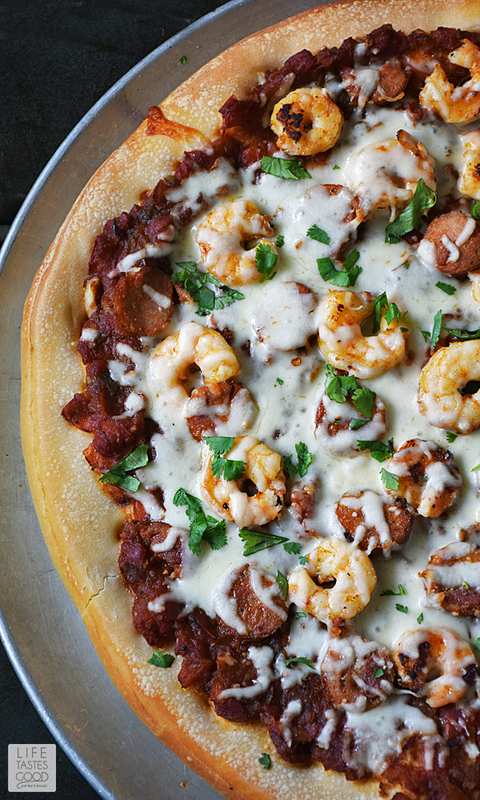 Cajun seasoned shrimp, Andouille sausage, the holy trinity of vegetables, and a zesty sauce all atop a soft and chewy pizza crust makes up this Jambalaya Pizza recipe. Who needs a bowl?! I enjoy getting creative in the kitchen. It's fun to toss the rules aside and put a twist on a traditional recipe to make it in a different and unique way. 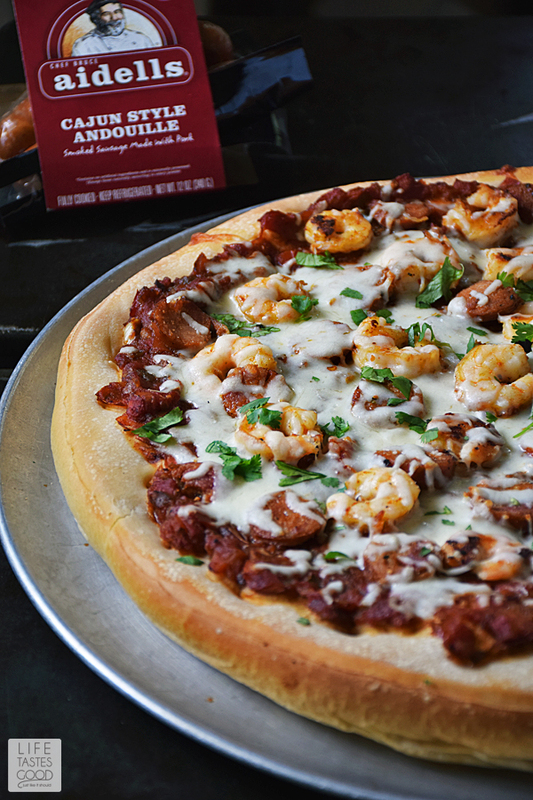 A few weeks back we were enjoying my Skillet Jambalaya Dip, another of my twisted recipes, for Mardi Gras when Don suggested putting the same flavors on a pizza! You see why I keep him around, ladies?! He has his moments and this was a good one! 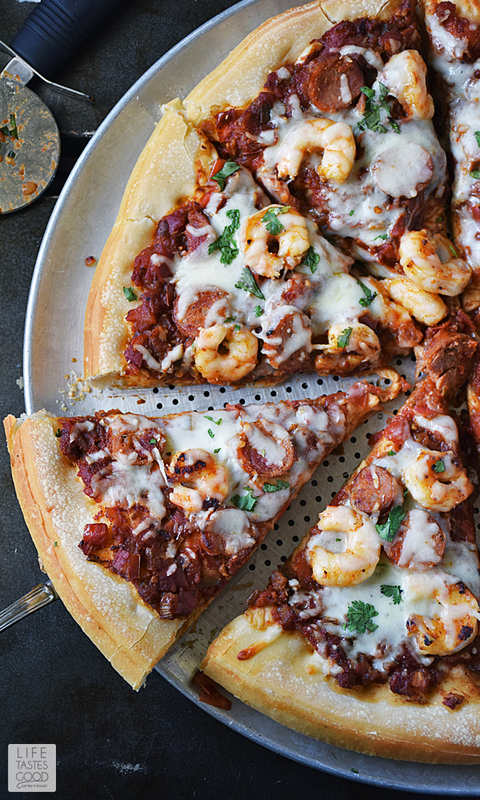 Jambalaya Pizza is traditional Jambalaya fused with an Italian favorite to make a hand held tasty treat you'll want to enjoy time and time again! It has that familiar Cajun spiciness you expect from Jambalaya, but the creamy mozzarella cheese cools it off a bit and brings a completely new texture to this Louisiana favorite! 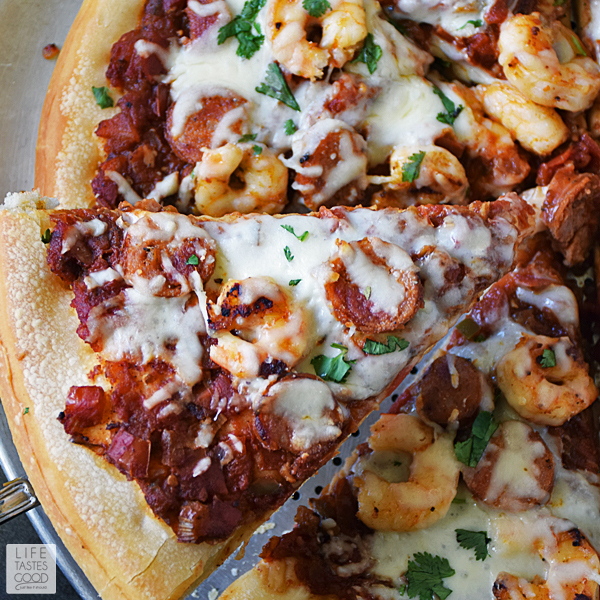 This Cajun/Italian fusion recipe is easy to make too! It's on the table in about 40 minutes and the aroma that fills the house will have your family running to the dinner table! You heard right! Homemade pizza in about the time it takes for delivery! I found everything I need at Publix, my second home as my husband says. Publix has a fantastic bakery where I get ready made pizza dough. Sure, I could make the pizza dough myself, but why, when Publix does such a fantastic job! It's a huge time saver! The produce section is also well stocked with the fresh ingredients I need for this pizza, and they carry my favorite sausage, AIDELLS® Cajun Style Andouille Smoked Sausage on the same aisle as the shredded cheese! I love one-stop shopping! AIDELLS® Sausage is hand-crafted with real, hand-picked ingredients, gluten free and no nitrates or added hormones. I like that! It is fully cooked and comes in a variety of unique and delicious flavors, making it easy to bring sausage to the dinner table! Publix has AIDELLS® Sausage on sale from March 17th, 2016 through March 25th, 2016. You get 2 packages for just $10! To make this recipe, first spray a 16" round pizza tray with cooking spray and lay the pizza dough on it. Stretching it to fit if needed. Preheat the oven to 400°F and heat a skillet over mid-high heat. 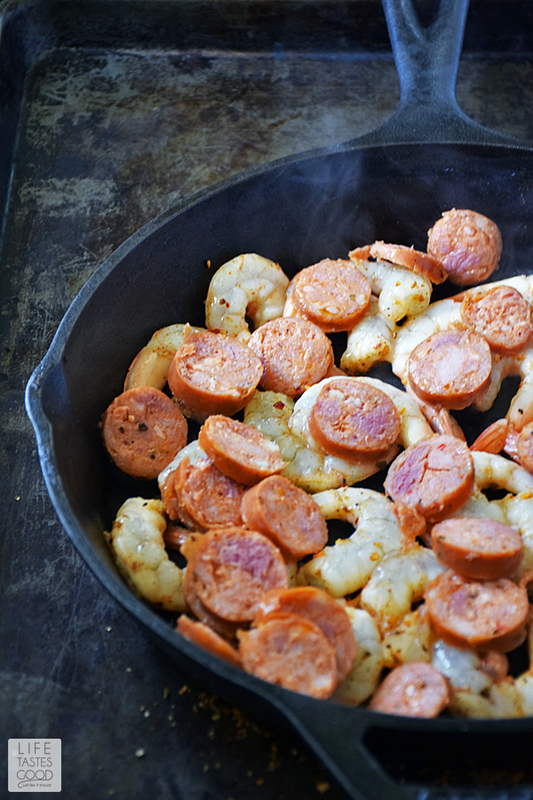 Slice the AIDELLS® Cajun Style Andouille Sausage into rounds, and season 1 lb of shrimp with 1/2 tablespoon of your favorite Cajun seasoning blend. 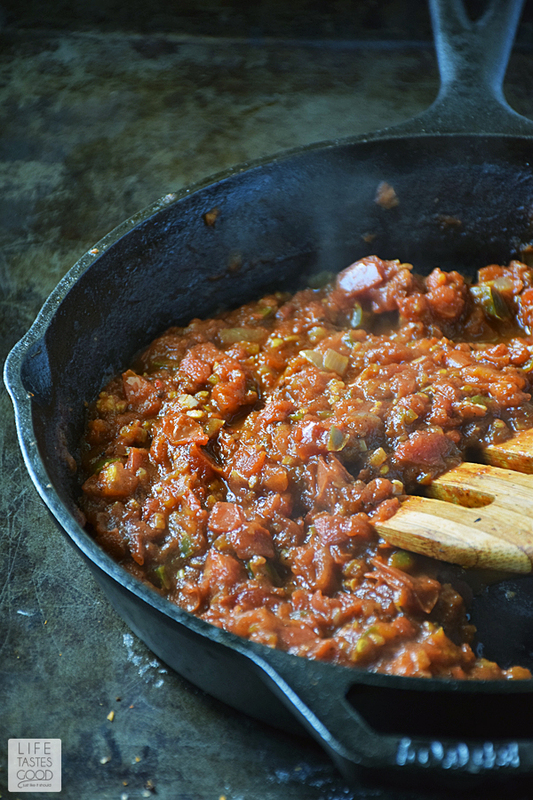 Add 1 tablespoon freshly minced garlic to the softened veggies in the skillet and cook another 30 seconds or so to soften the garlic. Add the diced tomatoes and a 1/2 tablespoon of Cajun seasoning. Stir to combine. Bring the tomatoes to a low boil and cook for 7-10 minutes until you can easily squish them with the back of your wooden spoon. The aroma of this mixture will start to fill up the entire house! It is amazing! 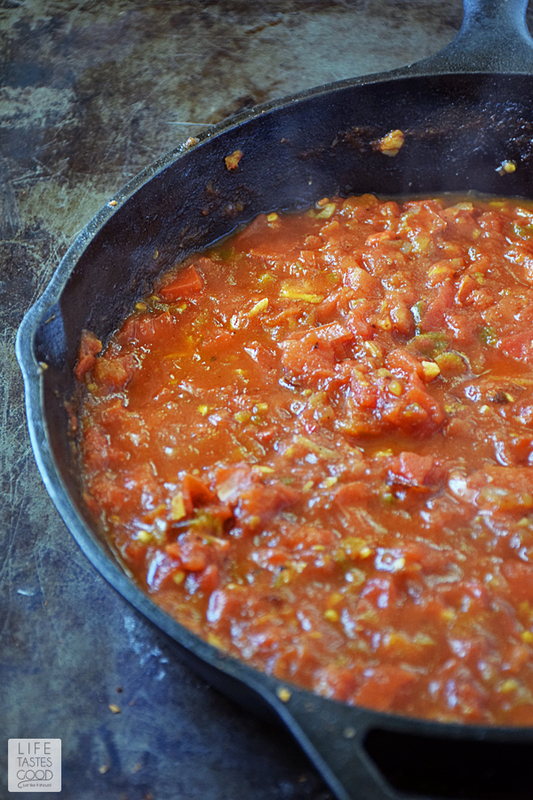 Pictured below is what my tomato mixture looked like after 7 minutes. 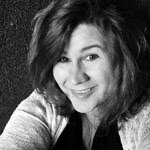 See how the color deepened and it got very saucy? That's a bit too saucy for a pizza, so we need to reduce it down to thicken it and deepen the flavor too. Now is a great time to put the pizza dough in the preheated oven and cook it for 10 minutes just to get it slightly toasted. Continue to cook the tomatoes at a low boil for another 7-10 minutes until the liquid reduces down to a nice thick, rich, chunky sauce. Give it a taste and adjust the seasonings as needed. Mine needed a pinch or two of kosher salt. I recommend tasting first and then mixing in a small pinch of salt and tasting again. Keep adding salt until the sauce tastes just right to you. 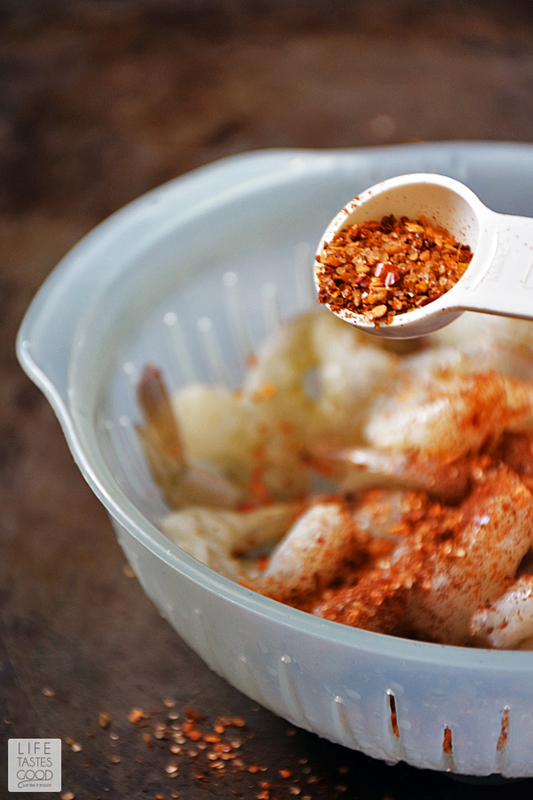 Add more Cajun seasoning as needed to suit your tastes. Look at how thick it is now! Perfect for pizza! 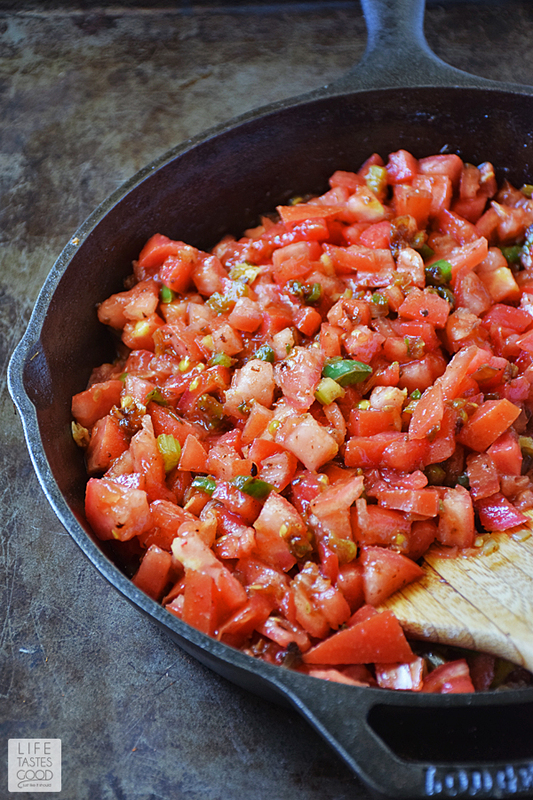 When the dough is ready, remove it from the oven and spread the zesty Cajun tomato mixture all over. 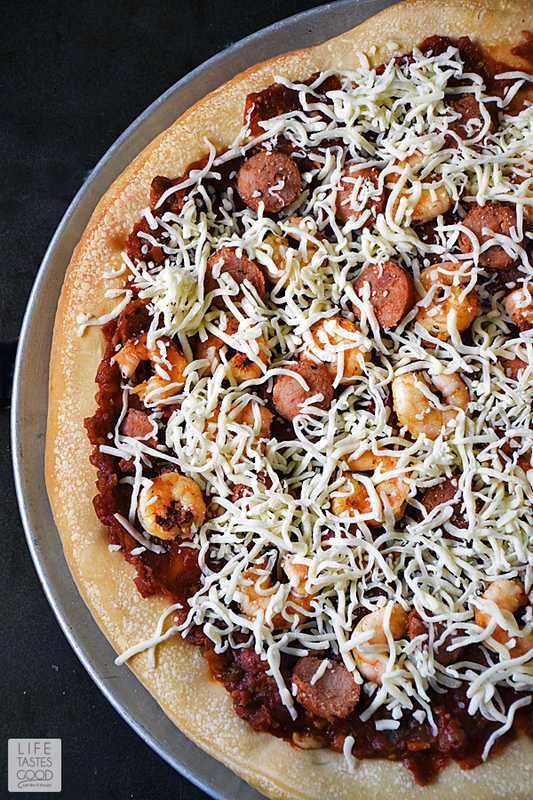 Top the sauce with the cooked shrimp and Andouille sausage. Top it off with 1 cup of shredded mozzarella cheese and pop the pizza in the oven for another 7-10 minutes until the cheese is melted to your liking. Preheat the oven to 400°F. Spray a 16" round pizza tray with cooking spray and lay the pizza dough on it. Stretching it to fit as needed. Heat a skillet over mid-high heat. 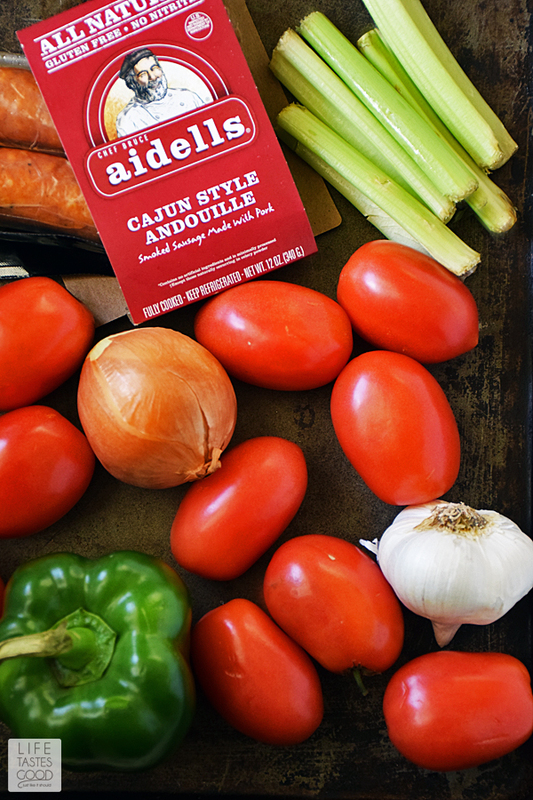 Slice the AIDELLS® Cajun Style Andouille Sausage into rounds, and season 1 lb of shrimp with 1/2 tablespoon of your favorite Cajun seasoning blend. While the dough is baking, continue to cook the tomatoes at a low boil for another 7-10 minutes until the liquid reduces down to a nice thick, rich, chunky sauce. Give it a taste and adjust the seasonings as needed. Mine needed a pinch or two of kosher salt. I recommend tasting first and then mixing in a small pinch of salt and tasting again. Keep adding salt until the sauce tastes just right to you. 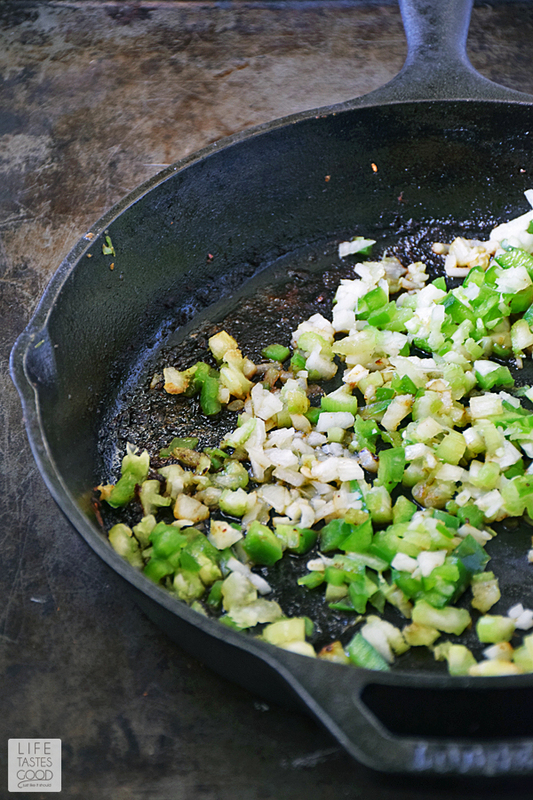 Add more Cajun seasoning as needed to suit your tastes. 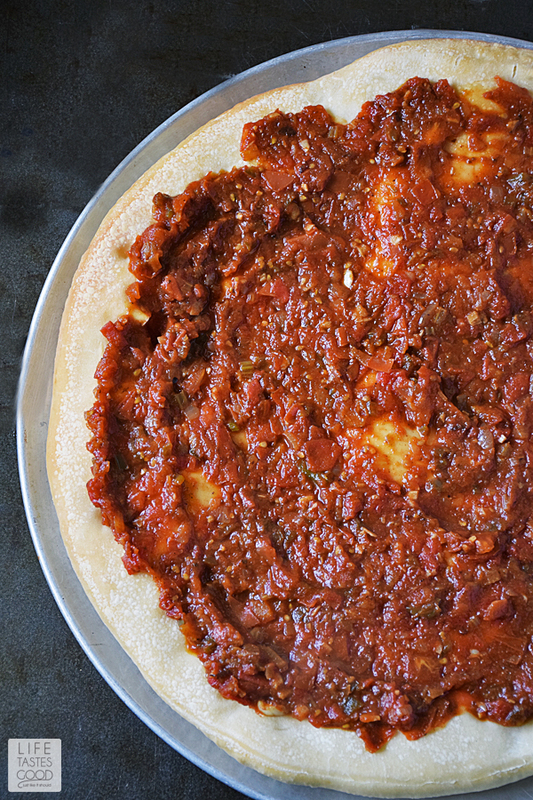 When the dough is ready, remove it from the oven and spread the zesty Cajun tomato mixture all over. 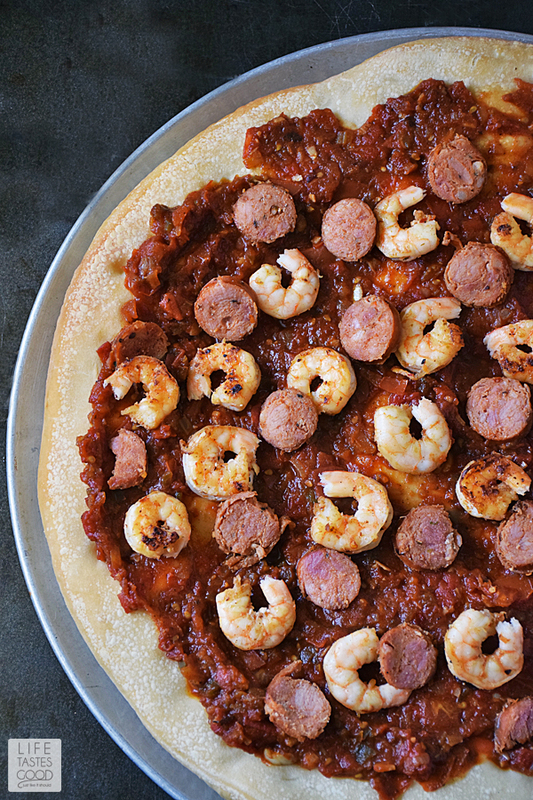 Top the sauce with the cooked shrimp and Andouille sausage. Top it off with 1 cup of shredded mozzarella cheese and pop the pizza in the oven for another 7-10 minutes until the cheese is melted to your liking.